All good Middle Eastern dancers know that to become a great dancer they must work with a great drummer. This series is designed to bring <?xml:namespace prefix = st1 ns = "urn:schemas-microsoft-com:office:smarttags" />Egypt’s best tabla players to belly dancers around the world. There is no substitute for working with a Master! 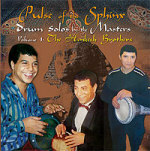 Volume 1: The Henkesh Brothers - For 30 years these brothers have reigned supreme as drummers for Egypt’s superstars. They have accompanied Mona Said, Nelly Fouad, Shoo Shoo Amin, Sahar Hamdi, Ida Nour, Nadia Fouad and Lucy. They have played for singers Ahmad Adawia, Amr Diab and Fatma Eid, to name a few, and have participated in Raqia Hassanâ’s Ahlan wa Sahlan Festival several years in a row. This CD contains over 60 minutes of drum solos and has something for all levels and styles of Middle Eastern Dance: 10 performance solos, each between 3 and 5 minutes long; 1 live performance by Khamis Henkesh and the Hanakeesh; 1 instructional track with the basic rhythms; & 6 practice solos for drilling.Mail in the card that is found in the CD jacket and receive a complimentary 36 page color booklet with articles about Middle Eastern percussive instruments, including finger cymbals, the basic rhythms, dancing to a drum solo and shimmy technique.